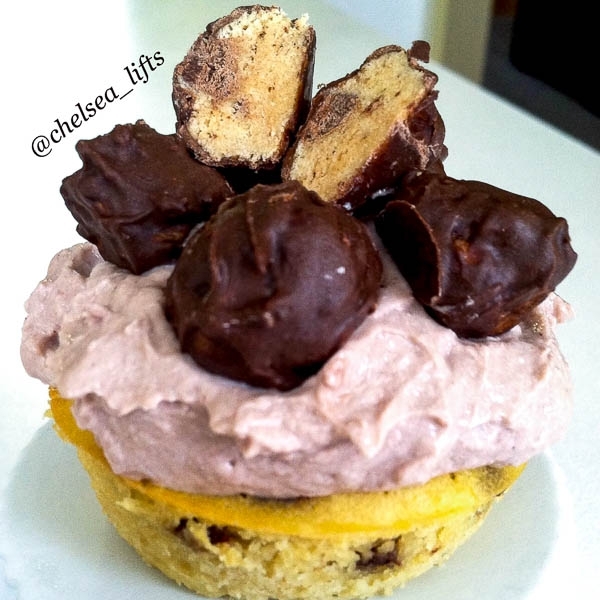 Chocolate Chip Cookie Dough Chickpea Protein Cupcakes topped with Protein Chocolate Frosting made from a Greek Yogurt base, and finished with Vegan-Chocolate Covered Chocolate Chip Cookie Dough QuestBar Bites! Drain, rinse, and clean chickpeas under water in a strainer. In a blender combine chickpeas, 1/3 cup almond milk, and 1/3 cup fate yogurt. Blend/Pulse until chickpeas are pureed and all ingredients are combined. Transfer mixture into a mixing bowl. Add in 1tsp vanilla extract, 1tsp baking powder, the stevia, and 1 scoop of About Time Vanilla Protein Powder. Mix all ingredients together until combined thoroughly. Whip in 1 large egg. Lastly, gently fold in the mini chocolate chips. Equally distribute batter into 9 sprayed muffin tins. Cook on 350F for 20-25 minutes (until cupcakes are baked through and bounce back when touched. Will be super moist and fairly thick. Mix together 1 cup Fage and 1 scoop AboutTime Chocolate Protein Powder until completely combined. Use frosting equally on the 9 cupcakes. Break apart a Chocolate Chip Cookie Dough QuestBar into 25-30 equal balls. Melt Carob Chips in a double boiler or in a fondue melter. Once Chips are melted roll QuestBar balls in the chocolate one at a time until completely covered and set on non-stick paper (parchment/wax) to cool and harden.